The American Ryder Cup team prepares for the weekend competition at Medinah. 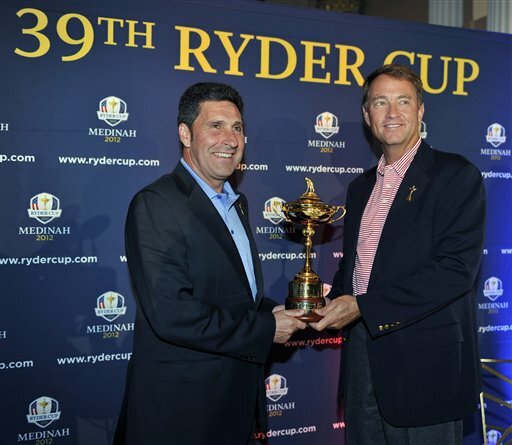 European Captain Jose Maria Olazabal and U.S Captain Davis Love III teams will compete for the Ryder Cup. Tucked in the western suburbs, Medinah Country Club is one of the most revered golf courses in the country. Now the world will get to see this famous club, which counts like likes of Michael Jordan among its 615 members, with the Ryder Cup in action this weekend. This is the first time this prestigious tournament, which rotates between the United States and Europe and is played every other year, has made its way to the Chicagoland region. The tournament has brought record-setting crowds to the region: The actual three-day tournament, which starts Friday, is expected to draw 40,000 to 50,000 partisan fans and the impact to the local economy is projected to reach $150 million. (Pro-shops are already seeing sales through the roof.) Internationally, the Ryder Cup is the third most watched sporting event, right behind the Olympics and soccer’s World Cup; over 1,800 media credentials were distributed to cover this year&apos;s event. The European team, led by Captain Jose Marie Olazabal, will be challenged by the American team, led by Captain Davis Love III. Twenty-four of the top 36 players will be in action on Course #3. Tiger Woods, who won both PGA tournaments held at Medinah, and Phil Mickelson are among the Americans trying to upend the 2010 defending champions. Luke Donald and Rory McIlroy, two talented players on the PGA circuit, will be lead the charge for the European team. Despite playing for Europe, Donald (a Northwestern grad) is the only golfer that actually lives in the area. On Sunday, the home crowd will wear a sea of red, since Americans are encouraged to wear red in the final day of action. The planning for Medinah to host the 2012 Ryder Cup actually took root during the 1999 PGA Championship. Medinah member and Ryder Cup General Chairman Don Larson said the decision was made by the PGA of America after the western suburban course successfully proved it was worthy to host this year’s event. Medinah has hosted seven national tournaments and six majors, including the 1999 and 2006 the PGA Championships. The Ryder Cup was impressed with Medinah&apos;s facility, its course and its location near Chicago. For the past four years Larson and his staff have worked closely with the PGA-America to prepare to the course and contend with the onslaught of visitors and the intense media spotlight. Course #3, established in 1928 following the previous two courses at Medinah, is known as a long, tough course. All the greens have had some minor alterations to make them all identical, but there was one noticeable alteration, according to Larson. “The major change was the 15th hole: We made it a drivable par-4 with a high risk, high reward consequence,” he said. The hole that may be a determining factor is the 16th. Bears kicker Robbie Gould played in the Pro-Am game on Tuesday and said it is the most difficult hole on the course. Gould also said the course was in perfect shape. It is a wonder with the severe heat this summer that the course did not suffer the consequences. Larson credited his grounds crew and the decision to close the course several weeks ago; the recent rain has resulted in terrific conditions. Larson thinks that when the players leave Medinah they will remember “a spirited atmosphere of competition and friendship with the love of the game of golf.” There is no money at stake in the win on Sunday. But make no mistake: The honor of winning the Ryder Cup is important to every golfer.